Hog Roast Arkley for a local Campervan Convention! Every year a group of dedicated camper van aficionados congregate in a field somewhere in the delightful English countryside to compare notes, swap ideas and show off their painstakingly renovated iconic vintage vehicles. This year, they were holding their annual get together in Hog Roast Arkley’s neck of the woods and called upon us to provide the catering for the most importance event in their campervan calendar! They chose us because our style in very similar to their own in the sense that we are very good at providing a little bit of luxury in the great outdoors with food of such high quality, it’s hard to believe that it has all been freshly prepared by us in the middle of a field! Whilst our company van might not be considered a vintage classic, our sleek hog roast machine didn’t look at all out of place nestled between two vintage VWs! As well as being incredibly practical and capable of producing vast amounts of delicious slow-roasted meat, our hog roast machines are also rather stylish contraptions and they always seem to fit in wherever we are cooking! Whilst the group were busy inspecting each other’s revamped interiors, reconditioned engines and restored paintwork, the Hog Roast Arkley team set to work preparing our own labour of love for the 50 campervan comrades. The party organisers opted for a classic slow-cooked hog roast and organic whole roasted chicken, accompanied by some fresh and funky crispy Thai salad, potato wedges and the option of gluten-free bread rolls for the couple of attendees who had this requirement. 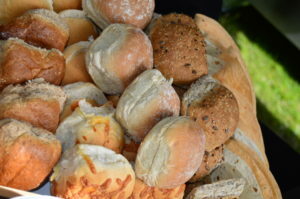 With enough choice to keep everyone happy and the food being served in a laid-back come and go as you please style, the group were able to enjoy the buffet whilst still being free to roam between campervans and check out the competition! Everyone who attended agreed that hiring Hog Roast Arkley made their yearly ritual even more enjoyable, so much so that they are tempted to quash their free spirits a little bit and come back to the same venue next year so we can cook for them again!